A commercial airliner with multiple engines can limp to a runway if one of them fails. But a small plane, driven by just a single propeller, is in more serious trouble when its engine stops. So researchers have created a tiny electric backup that kicks in during an emergency, ensuring the craft can safely get to the ground. 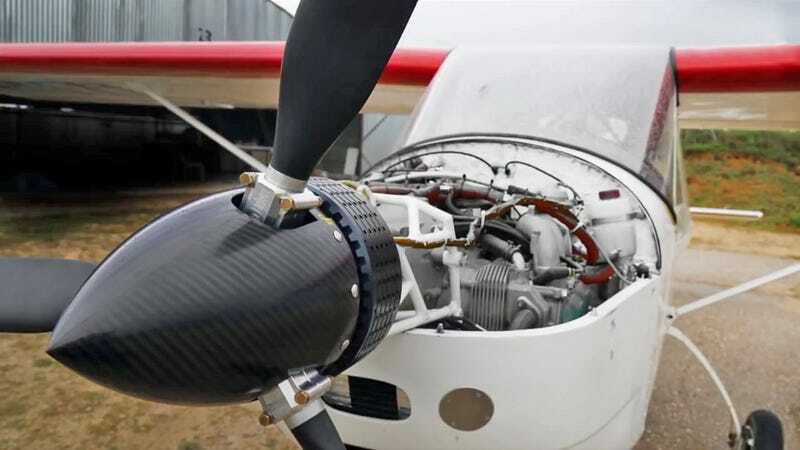 Jointly developed by researchers at the Universidad Carlos III de Madrid and AXTER Aerospace, the tiny electric motor can be installed as an aftermarket upgrade because it’s designed to sit just behind the plane’s propeller. It’s also wired into its own dedicated backup battery that’s kept small for weight reasons. Since the system is specifically designed for small planes maxing out at around 1,650 pounds, keeping weight to a minimum matters. With such a small battery powering the electric motor, though, the emergency backup system isn’t designed to get a plane to its original destination should the primary engine fail. Instead, it gives a craft an additional range of just 12 miles to find a safe place to land in an emergency. In other words, it’s really only there to prevent a deadly crash. However, since the electric motor’s backup battery is constantly being charged by the main engine, it can actually be used outside of emergency situations as a sort of hybrid powertrain. Pilots can turn it on for an extra 40 horsepower for takeoffs, or to improve fuel efficiency during a long flight. But only as long as the plane’s main engine is running, to ensure the electric motor’s backup battery remains fully charged.